A great deal of unease works in filmmaker Cate Shortland’s favour. Her dramatic period piece Lore always feels restless. Characters – young and old – are constantly looking for stability and safety and the environments are always changing. That’s not to hint that Lore is inconsistent with a short attention span. It’s a compliment that Shortland has found the perfect unsettling tone to allow all her elements to work on. Lore shows us a perspective that one would immediately dismiss or bypass judging by the amount of WWII movies told from Jewish peoples’ point of view. 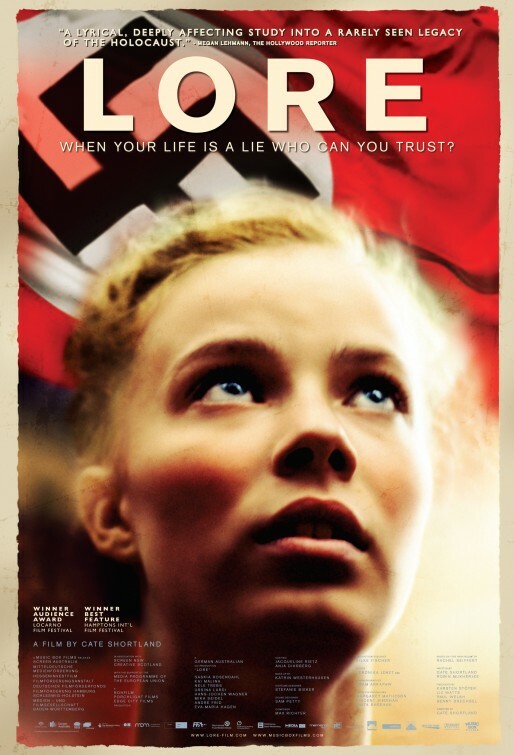 Lore is told from the outlook of a Nazi German family after their Führer has been dethroned. Sole faith and maternal instincts are passed to the eldest daughter Lore (played by Saskia Rosendahl, a surefire young talent). Befuddled and frazzled, Lore takes her four siblings on a long trip to their grandmother’s house. It’s there where the brothers and sisters will find true comfortability and be even more hidden away from the truth that follows their family. For Lore, she unravels this history as her travel progresses – making sure these new facts don’t infiltrate her siblings’ innocent world. Shortland and her screenplay (co-written by Robin Mukherjee adapted from Rachel Seiffert’s novel) asks a lot from its cast regarding that element of unease- especially Rosendahl. That lack of steadiness helps input fear into these performances that are riddled with subtleties. Even when the family is soaking in the quiet time as well as the new people and things around them, Rosendahl makes sure her guard is never down. The film’s look (fantastically shot by Adam Arkapaw and edited by Veronika Jenet) takes on an absolutely flawless authenticity that will undoubtably fool you into thinking you’re watching a legit artifact. It’s during key moments of silence that you feel as if you’re not watching a manufactured movie anymore. Each landscape is captured in such a way that movie goers will admire the view but also be kept on the edge of their seats anticipating the worst. The screenplay is, for the most part, commendably well written. However, the most admirable quality of Shortland and Mukherjee’s script is that it never begs for sympathy. We’re made quite aware that our leads have beliefs that are deemed as unequal. But when we’re drawn in to these characters, those views are set aside and we’re watching these people as scared human beings. In many ways, the tables have been turned. When Lore and her siblings are in the tightest of spots, the fascination we have to see them escape doesn’t originate from a desire to see these people get caught, but based on a humanistic quality to see this particular group reach an endgame their fighting for. The only time the script sags is during an interesting dynamic where our leads meet up with an alpha-male with a background that Lore finds troubling. The introduction to this new character and the bond that forms between him and Lore is believable at first, but soon develops into more of an obvious cinematic romance to keep those looking for a love story tuned in. That resentment Lore has initially is dropped way too fast and offers the only visible seams in this otherwise creditable time capsule and tale of a forced but developing parent. However, Cate Shortland has delivered a terrific film with unquestionably strong performances and a realism like no other fictional movie. But most of all, Lore offers a factual rare look at an otherwise challenging angle – and Shortland does this without breaking a sweat.